Six years ago, we produced the first “Tuning In” movie and had no idea what to expect. David Thomas, the director and driving force behind the project, simply knew that the channeled messages he’d been exposed to had deep resonance and benefited his own life. “I was a mid-level Hollywood screenwriter in a fairly sad state of mind when I stumbled across some of these channeled messages,” says Thomas. “I found that they really had deep resonance with me and gave me some profound answers I’d been searching for. It turns out many people around the globe were hungry for such spiritual fare and the DVD sold in more than 30 countries. “Tuning In” is still a popular film at Gaiamtv.com. Now, Thomas has assembled those who appeared in the first film and will conduct all new interviews with fresh, vital information. Those who have agreed to take part are Geoffrey Hoppe (Adamus); Lee Carroll (Kryon); Darryl Anka (Bashar); John Cali (Spirit); Wendy Kennedy (Pleiadian Collective); and Rob Gauthier (Treb). More may be included, depending on funds raised. Some of the topics that will be covered are: creating abundance, how to raise vibration, love relationships, and perhaps what really happened to missing flight 370. This planet can be an intense, confusing place and we passionately believe films like the upcoming “Tuning In Now” can shed light, literally, on what’s happening and help us navigate. These sources of non-physical intelligence we feature are founts of wisdom and are here to graciously guide us. They all make it clear, however, that we are masters-in-the-making and our evolution is up to us. They are simply happy to help. And so are we here at Tuning In Films. We wish we were independently wealthy or had Bill Gates as an uncle, but unfortunately we are not and do not. There is power in our collective efforts, though, and if you are reading this, you are a part of a grand movement, one that will eventually transform this planet. We are all doing nothing short of birthing a whole new way of being here on Earth. Our movies are a terrific part of this effort. We need a minimum of $33,000 to make the film. This is a pittance by Hollywood standards, but we have learned to be very efficient. To include more channelers and have better production values, we need even more than that minimum figure. We need to pay a crew to travel and interview the channelers in Southern California, Colorado, Wyoming, Michigan and perhaps other places as well, hire professional editors to shape the film, buy equipment, then make and ship the DVDs. Basically, the more money we raise the better the film will be. Of course we are offering many perks for your participation. Everything from a free DVD to audio CDs (many hours worth) of every word we record while filming to becoming a producer on the film and having input. All this is detailed in the section below. We are chomping at the bit to get going with this film and we SO appreciate all the support we know we will get. There will come a day, and it’s not too far off, where the “Tuning In” projects and similar fare will be staples on mainstream television, so why not be in the vanguard by helping us make these valuable movies? Not to get all grandiose here, but films like “Tuning In Now” truly do help transform this planet. We have spent ages upon ages in dark consciousness and now we are choosing something different. The game of might is right, bloated materialism and abject greed has grown stale for most of us and is being phased out. We are beginning anew on a more light-filled gameboard and no one knows the exact outcome, but it certainly is exciting. 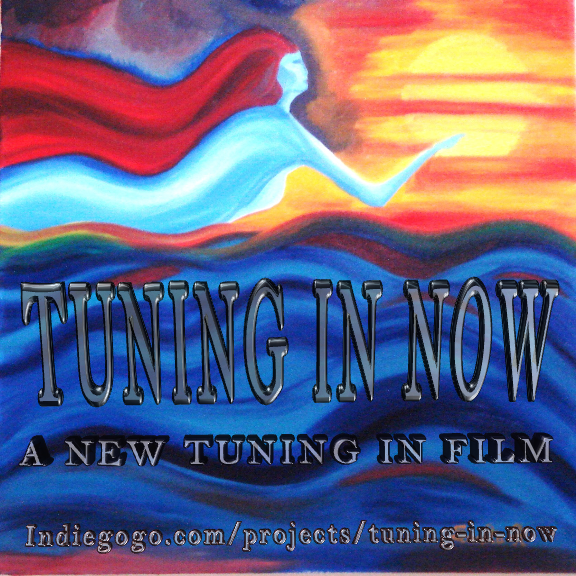 Films like “Tuning In Now” are campfires in a dark wood. We can gather around them, be warmed and nourished. And once we build enough campfires, the entire world becomes illumined. We lit the match with “Tuning In” six years ago and now will stoke the fire. This sequel will be more vibrant, more exciting and more valuable. It will help burn away the dross of ignorance and help light the road as we march toward becoming the enlightened people and culture we really want to be. If you simply don’t have the means to help with money, keep a good thought for the project and help spread the word, please. I just read the info about the new projet: Tuning In Now…. Thanks very much, Niko, for your kind message. I love the original movie and accompanying book. It’s how I was introduced to channellers and their wonderful teachings (including yourself and spirit of course). I had to watch the movie on YouTube as the DVD format here is different. It will be really wonderful if a new movie is released and I really hope the guys secure the funding. Thanks very much, Sarah. Yes, I remember the DVD format is different there. We’re all looking forward to the new movie. Whatever happened to “Tuning in Two”? I came across the trailer years ago, which is still on youtube, but never the movie. The links I found only lead to the first movie. I honestly don’t know. But I’ll ask David. beachdrifter, David said there are only a few copies left. Anyone who wants one them can send $28.00 (US dollars) to tuninginfilms@yahoo.com through PayPal. Thanks, John! So it does actually exist! Would be nice if there was a website for it with more information about it and the channelers. One of them looks a bit like Lee Carroll (Kryon), but I’m not even sure about that one! You’re most welcome, beachdrifter! It does exist, but perhaps for not much longer. David most likely won’t publish more DVDs unless the demand for them grows. As I think I mentioned, the original supply sold out. Perhaps this new movie will spur more interest in it. Another thing here, beachdrifter. A friend just reminded me of this — I’d forgotten about it. In addition to Tuning In Two there was another presentation called Tuning In Again. That did have Lee Carroll in it — plus Geoffrey Hoppe, Steve Rother, and Jim Self. I don’t believe it was a film, only a presentation on Awakening Zone Radio, which is owned by Crimson Circle (Geoffrey Hoppe). I heard there’s another movie called “TUNING IN TWO”. Is it from the same director? I believe it is. David’s also written a book “Tuning In: A Journalist, 6 Trance Channelers & Messages from The Other Side.” He created the book from all the “behind-the-scenes” information that did not make it into the movie. Yes, I read it. Wonderful book! Veronica, David said there are only a few copies left. Anyone who wants one them can send $28.00 (US dollars) to tuninginfilms@yahoo.com through PayPal. Thanks very much, Joseph, for your kind words and support.